I tend to be mid-way through several books at once, I think this worked fine when I read physical books but it's become a problem with using a e-reader. There's no real limit to the number of books I can start and still be able to keep track of where I am, which means I never finish anything! To try and avoid this problem, I've changed-up my reading style on the e-reader and I'm only reading a single book at a time. 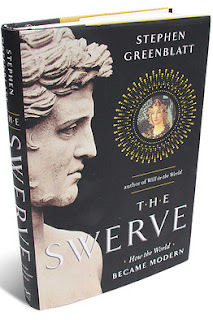 Most recently I read "The Swerve: How the World became modern"
The Indus Valley civilisation (in modern day Pakistan) had underground sewers and plumbing in 2700 B.C. London didn't get something similar until 1800s A.D! Epicurus (300B.C.) had a secular model of the universe based on the concept of atoms and void. Though he came about this intuitively and not through experiment! And it is Epicurus that is covered in the book. A few 100 years after Epicurus' death a guy called Lucretius writes a poem called 'On the Nature of Things' which expresses Epicurus' philosophical ideas. These ideas include that everything is made from atoms and the void, there's no afterlife, if gods exist they couldn't possibly be concerned with man and that the greatest good in life is to maximize pleasure and minimize pain. The book covers the journey of this poem, through it's loss and subsequent rediscovery in the 1400s and how it's subversive message went on to spark the enlightenment. It's a good read with a lots of interesting facts such as Thomas Jefferson owned several copies of On the Nature of Things and identified himself as a Epicuruis and that some of the fonts we used today are most likely based on the hand writing of Poggio the guy who rediscovered On the Nature of Things in 1400s. I did find the book starting to drag a bit going to a lot of Poggio's life and politics of the Roman Church but it picked up pretty quickly after that.